I've always been a fan of jerky. It's the perfect food for when you want a nice, tasty snack, but don't want the guilt of eating something crammed full of sugar. I've somehow convinced myself that jerky has zero negative health effects, the same as I feed with dry roasted peanuts and Lucky Charms. Maybe I didn't have a very good health teacher in high school, I dunno. In any case, I never ventured far outside the standard beef jerky. I've had some homemade venison on occasion and it's not bad, and I've had all sorts of carne seca beef jerky and hot sauce-infused beef jerky and many other flavors, but in the end it's always just good old also sodium-in-a-stick. About the only thing I've ventured outside of that is turkey jerky, the success of which I am wholly convinced is due only to the fact that it rhymes. (It's actually quite tasty.) I think I've also had ham jerky, but the only problem with that is that there is a 50% chance I'll accidentally pick up Maple Sugar Ham Jerky, which is nasty and violates the rules of my jerky-is-healthy misconception. So when I saw a little display at the butcher section of my local grocery store, I thought it was interesting. It had all sorts of various animals that are most definitely not cow, pig, or turkey. If you want to make a zookeeper cry, you can visit Buffalo Bob's poorly-designed web site here. These jerky sticks then sat in my refrigerator for like a month because I was too scared to eat them. Thankfully, it's jerky, so it wasn't going to go bad anytime soon. Still, I suspected that they were going to taste largely like regular jerky. If you can see the label above, it says "with beef," so I assumed that these meat treats were going to be 2% ostrich and 98% beef, salt, and seasonings. I was, in fact, wrong. Or, for the most part, I was kind of wrong. I tried the kangaroo first, and I was pleasantly surprised. It certainly didn't taste like beef jerky, but it was similar, and it was quite tasty. It got an immediate thumbs up from me. I'm not sure if it's different enough from other types of jerky for it to be a go-to snack, but if you want to try one that's a little different this is a safe bet. The second one I tried was the ostrich. I was expecting it to be a little gamey, and it was. Because the meat was a little more tender than the others, the casing had a little bit of a snap to it. It still tasted good and much different than, say turkey, but it was my least favorite of the bunch. 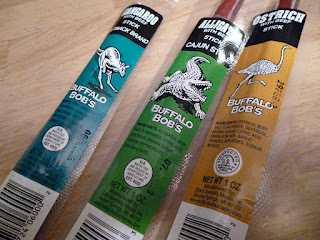 Finally, sadly, I cheated a little with the alligator jerky. I was expecting it to taste like luggage, so I opted to get the Cajun-style. (Because alligators are from Louisiana, you see.) So I can tell you that the alligator stick didn't taste like a pair of shoes, it tasted like CAJUN. As in, the Cajun spices were so strong I could have been eating a sofa cushion and still would have gone in for seconds. The price was right for these (I paid about a buck fifty for each, not horribly out of line than with standard jerky sticks). I may try the other ones, but quite frankly I've had elk and buffalo and the others and they don't taste sufficiently different enough from beef for me to go out of the way to try it. Still, if you are a fan of jerky, you can buy some of these and tell the ladies you're all impressively exotic because you've eaten kangaroo. Shh, it will be our secret.